The 2017 Honda Civic Type R is full of funky styling and harsh angles, to the real annoyance of lots of folks out there. But the strange three-exhaust-pipe layout on the back of the car actually serves a purpose, and it could be more useful than you thought for touring your Type R around on longer trips. The outside pipes are meant to quiet down the car at certain times, the folks at Road & Track found out from a product planner on the new Civic recently. Before you freak out and potentially regret spending way over MSRP on the new Type R, hold up: The quieting down is meant for highway speeds, so that your engine can grunt and growl all it wants taking off from a stoplight but won’t snarl you all the way from the Atlantic to the Pacific on your cross-country road trip. 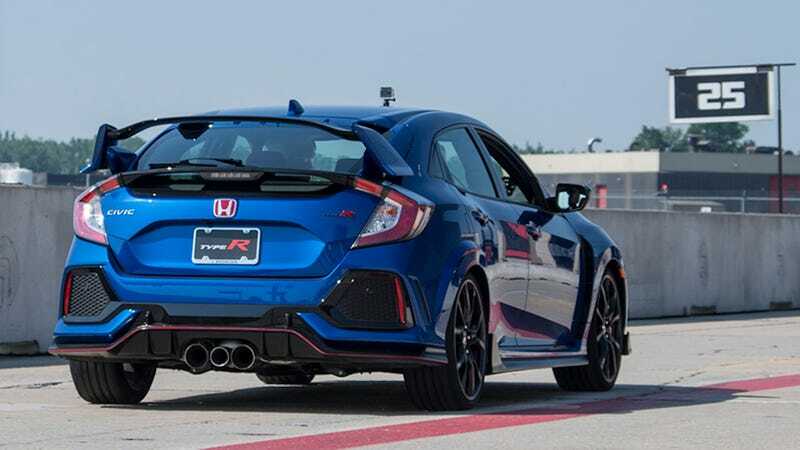 “Traditionally with these big flow exhaust systems, when you get up into highway speeds, you can get a lot of droning, booming, buzzing—not very comfortable for high speed cruising,” [10th-generation Civic product planner Rob] Keough told R&T. Honda wanted to offer a sporty, engaging sound in aggressive driving, without punishing drivers on long commutes or highway trips. And the automaker wanted to do so without resorting to stereo-enhanced engine sounds or complex (and expensive) multi-mode muffler systems. The solution is to split the single exhaust into three pipes just behind the rear axle. The two outer pipes include large straight-flow mufflers. The center, smaller diameter pipe is a resonator, shaped and sized to perform a particular aural trick. That sounds like a decent compromise, but maybe it’s not so great—our old pal Doug DeMuro said the Type R sounds like he’s driving his dad’s old Camry when he downshifts to fourth to punch around someone on the highway. Whether that was the goal exactly, who knows. If you want to read more technical details about how Honda made that middle exhaust pipe so useful, maybe, Road & Track has them. Correction: The middle pipe is the loud one, not the quiet one. We’ve fixed it to make that more clear. Our bad.